That’s what my Dad told me as I spoke with him on the phone, August 2006. The doctors had finally diagnosed why he had felt so poorly for the last few months. Pancreatic cancer. There’s never a good time to lose your Dad. He was 64. He had never even had penicillin in my memory. In April he started feeling poorly. In May, he quit drinking beer, so I knew it was serious. In July, the doctor diagnosed him with an ulcer. In August, they finally figured out it was pancreatic cancer. On September 3rd he died. Cancer is never nice, but this type is really mean. Steve Jobs has meant something to me both because of his record as an entrepreneur, but also as a pancreatic cancer survivor. Mr. Jobs seemed to me a fighter in all things, and he did well to be strong for so long. I talk to students in my classes about the definition of entrepreneurship. About creative genius. As you might guess, Steve Job’s name comes up every time. I ask another question. “How many parts on the original iPod, vintage 2001, were manufactured by Apple?” They laugh when I show them a picture and I tell them I had one. The students are quiet at first. “Was Apple a new company at the time,” I ask. They know that’s not the case. Apple had been building computers since 1977. The answer to the question? Zero. 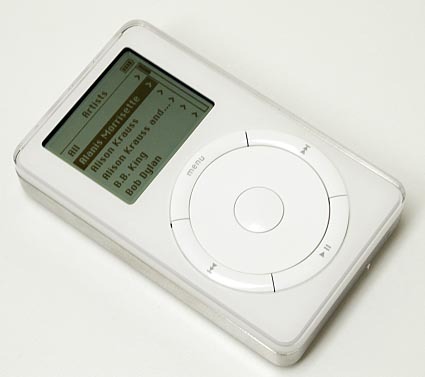 Apple didn’t manufacture a single part for the original iPod. They built the operating system, but theoretically every single part on the device could have been purchased by any other entrepreneur or company and assembled in the same way. But that didn’t happen. Dreamers live in the theoretical. Entrepreneurs like Steve Jobs live in the real. The point for students is that creative genius is most typically assembling old things in new ways. There are very few, if any, examples of businesses created from thin air or some kind of divine inspiration. That isn’t to diminish the record of Steve Jobs or any other entrepreneur, but to communicate that the power is within each of us to make a difference. When Dad was diagnosed, the doctors went on to explain that modern medicine didn’t have a particularly good explanation for why pancreatic cancer occurs. I remember talking to my brother and sisters and reflecting that, in Dad’s case, living had created the perfect conditions for dying. For Steve Jobs, though only 56, I think much the same. He lived. Rest in peace.